I had humble beginnings. A shelf in our bedroom. Which quickly grew to overtake half of our living room in our tiny one bedroom apartment. Fast forward to a house, with an entire ROOM, which I had no problem filling. When I had to condense down to half a room and share with the guest room, I actually found it liberating to purge my stash. There were so many things I no longer loved or wanted, or had bought because they seemed necessary or an amazing deal…only to be clutter and trash, later. So I gladly let things go, fit all my stash on my Expedit, and moved forward with that mindset. That helped a lot when I downsized again, this time to three shelves in our kitchen pantry, as the guest room became my daughter’s bedroom. I scrapped there for a year and a half, when I was suddenly granted a corner of our basement family room. This corner should have been more than enough space. And it is, or was. But with the increase in space came a small increase in our cash flow, and thus a huge increase in my scrap stash. The thing with scrappy shopping is that it really doesn’t take much money to buy supplies. There are always sales, coupons, discount retailers, buying secondhand, etc., and it is too easy, I think, to acquire a whopper of a stash. I am back to feeling overwhelmed by my supplies, not inspired, and all I seem to want to do now is shop and re-organize to fit it all, a vicious, unending cycle. I want the feeling of productivity and creativity and inspiration to be flowing again in my hobby. My first BANKIT haul from ScrapbookGeneration.com. Now I’d like to actually USE some of this yumminess, not just store it! So, I am setting out to systematically work my way through my scrappy stash. This is going to take years, probably, as I don’t get to scrap all that often, only in small chunks of time carved out from guilt and unending household chores. But here I go, I WILL do this, I WILL tame my stash, curb my shopping impulses, and actually USE my supplies to create, which I know from past experience is the most empowering and joyful way to experience my hobby. It all starts with an inventory! Click here for a separate page where I will itemize my scrappy stash and link to posts where I share what I did with those items. I’m excited to try this, and I hope it will inspire someone else, too! For this layout, I used the Simple Stories Hello, Baby collection. I bought the Simply Basics pack (love love LOVE that they do this, a pack of B sides, yes please!) and one cut apart sheet. So for $7, I have the equivalent of a collection pack, as far as I’m concerned. I can get several layouts and cards with the look of the collection, and not shell out the $20+ they want for their collection packs. I did add in a sheet of metallic gold heart vellum from We R Memory Keepers, and of course, my go to white Bazzill cardstock for the foundation. I stacked a lot of papers, and distressed the edges of every piece for a bit of a shabby chic feel. I stamped and heat embossed (pale pink and metallic gold) a ton of tiny stars and hearts from Ali Edwards’ baby stamp set, and scattered bling amidst them, too. Some Twinkling H20s along the edge and some jute and heart snaps tied it all together. Thanks for the heads up, Kay–hopefully this fixed it? Hahaha! I found the other layout. All the papers are Echo Park, and I just used the sticker sheet from the same collection, my punches, and some twine to dress up the layout a bit. TFL! Love that I have captured both of these stories. Such cuties. I guess it was a play off of Tinker Bell, but it’s a name that has stuck. I use it whenever Amy B is feeling particularly ornery or up to some toddler mischief, like in these photos. It’s funny, because I have some pictures of Izzy at close to the same age, doing the EXACT same thing. :-) Different couch, different level of the house, and a different box of tissues–but they tell the exact same story. I’ll try to find it and post later this week. Here it is! Fun layers of gold lame mist, a doily, a sunny flower, punched cork, flair, and bling. A stamped BINGO card, dressed up Tim Holtz clip, and an ancient “Proverbs” strip, converted into a banner. STILL trying to use up my alphabet stash… Slow going, I tell you! As a side note, punched cork shapes have very little structural integrity! They broke and crumbled if I had to shift them a little, so I ended up cutting some in half to replace one beyond saving, then had to do a lot of surgery on what was left so I had enough to create a visual triangle with the cork elements. There’s three with a grid combo of four squares–I chose to center a sentiment on the patterned paper and wrap twine around the bottom. Pretty much all of the sentiments for the whole set include a combo of heat embossing and plain ink. Like on the Father’s Day cards below, the frame and “Happy” are Pumice Stone Distress Ink, and the “Father’s Day” is heat embossed in silver. Love the texture, dimension, and depth this gives. Had a couple that I really had to search for images to add…one was definitely masculine, but the dress form stamp was a perfect fit for the other! Sentiments are stamped on the inside. A couple of cards I dressed up with borders or additional matting and twine. Then I ended up really winging it with these three, and made banners and bunting. Threw in a tag and a doily. All of these are also dressed up on the inside a bit. My first video! There’s definitely room for improvement, but I had some mindless down time sans kids this week while recovering from sinus surgery. 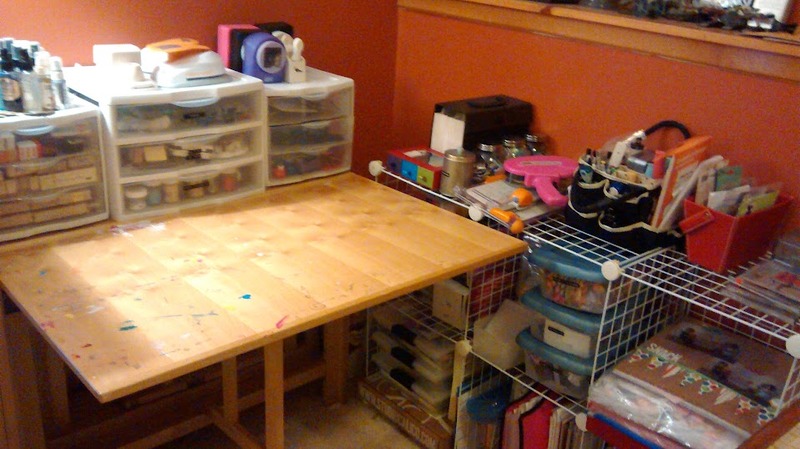 It allowed me to finally put away all of my scrap crap that has been building for months! And with the clean sweep came the urge to try my first scrappy video, so here she be. Leave me some feedback! TFL! One of my last layouts created at Archiver’s in their crop room (sigh…I will miss them! )… A friend’s birth announcement for their third child. Scattered clear sequins (may be hard to see,but look close, they’re there!) with pink and clear bling in a diagonal, leading the eye from the bottom right, from title to photo. Used SNAP! cards, a fun kraft envelope, an acetate monogram, floss and ribbon, and felt hearts for layering. TFL!